The Mediatrix Gateway is treated by DLS like a DCMP enabled device. DLS cannot contact directly with the Mediatrix Gateway. The DCMP-like configuration is part of the Plug&Play and Registration of the Mediatrix Gateways on DLS and is described below. The actual DCMP configuration of DLS is not applicable for Mediatrix Gateways. On the Mediatrix Web Management the following settings must be configured in order for Mediatrix to be aware of the DLS IP and initial settings. 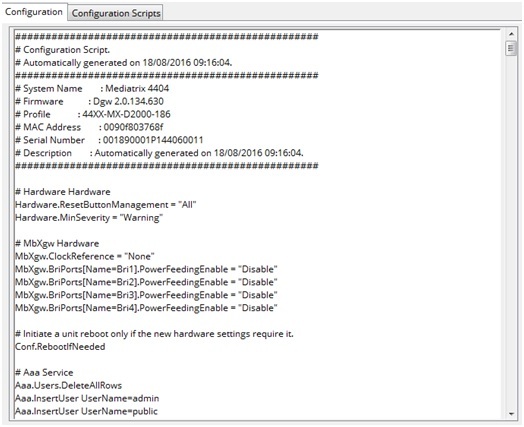 Go to Management > Configuration Scripts> Execute Scripts. 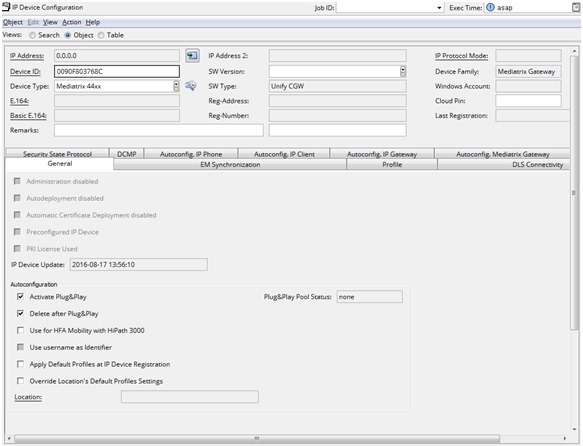 The above settings could either be set manually or automatically with DHCP. After configuring the above, press Apply & Execute Now. The Mediatrix Gateway will register on DLS. b. Go to Mediatrix Gateway Configuration and do the rest of the configuration. In the Configuration Tab the complete list of settings can be added by Copy/Paste from another already registered Mediatrix Gateway or from a Template/Profile, in order to set values different from the default ones. The Configuration text area can be left empty. The current settings of the Mediatrix Gateway will not be affected. 2. On the Mediatrix Web Management the following settings must be configured in order for Mediatrix to know the DLS IP and initial settings. The above settings could either be set manually or automatically with DHCP. After configuring the above, press Apply & Execute Now. The Plug & Play shall start. The procedure for the Software Deployment is the typical one with one exception. The Mediatrix Firmware is a zip file. The zip files need to be put in the selected FTP/HTTPS Server’s folder and the content of the zip files also need to be extracted there. Both are needed. The rest of the procedure is the exact same. The Software Deployment job is treated like the rest of the Jobs. NOTE:Do not unpack the zip file contents to a subfolder otherwise it won't be properly acknowledged by DLS and consequently Mediatrix s/w deployment won't be possible. This page was last edited on 4 June 2018, at 09:42.